'What is a lectureshop?' is the question most people ask. Basically, a lectureshop is a workshop where there is more lecture and less work. 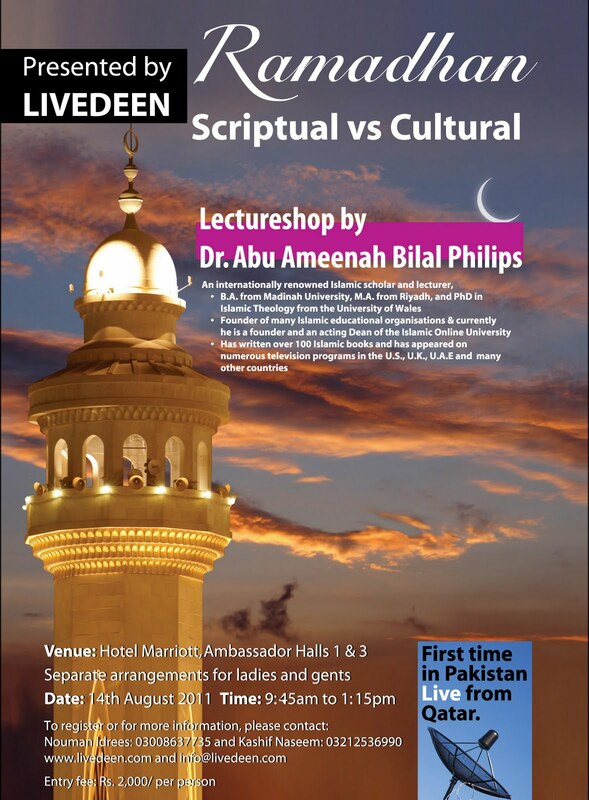 In the one that I went to, the lecture was given by Dr. Abu Ameena Bilal Philips, on the topic of 'Ramadan: Scriptural -vs-Cultural'. Have a light suhoor and a light iftar. Fast for Allah, not the people. Delay suhoor, hasten for iftar. If the fajr adhan is happening and you are eating or drinking, you can quickly finish it ( DO NOT TAKE MORE). Praying 8 rakah of tarawih is the sunnah, don't make it a must to pray 20 rakah. The times given on charts for suhoor and iftar are just approximates to alert you that the adhan will happen around this time. People who don't wait for the adhan and just start or break their fasts because the time is written are doing a bid'ah. Always wait for the adhan. Ehtekaf has to be done at the masjid only, even for ladies as the Prophet Muhammad SAW's wives used to do it at the masjid. After this he was asked to give us a briefing on The Islamic Online University which he did. He then signed off, and then we (audience) were all given a feedback form, and a paper on which we had to write a letter to ourselves on what we will achive this Ramadhan.This finished we went for Zuhr in the masjid downstairs. Alhamdulillah, from this session I learnt a lot about the mistakes most of the people in our society make. I hope that later Insha Allah they have another session like this. can you please tell me where did this lectureshop take place? At Marriott Hotel Karachi. 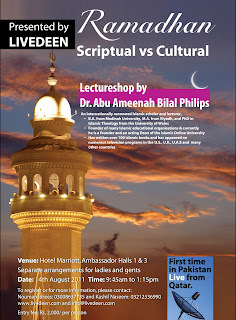 You can visit livedeen.com for info on their upcoming lecture-shops.